Our victory in the ACM ICPC Regional Contest in Kaohsiung, Taiwan, opened our way to the world final. Our team, consisting of Felix Halim, Andoko Chandra, and Andrian Kurniady (Me), representing Bina Nusantara University, was invited and attended this year's ACM ICPC World Final in Tokyo, Japan. We were accompanied by Mr. Raymondus Kosala and Ms. Yenlina Prasetio from BiNus. This wonderful event, which includes a one-week trip to Tokyo, produced quite a lot of stories to be written here. The stories will be in a chronological day-per-day order accompanied with photos. Hope you enjoy it. 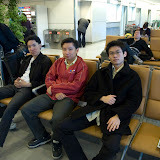 We departed on this Sunday night, flying with Singapore Airlines to Singapore and then Tokyo. We arrived in Tokyo at the very morning, take a bus to the Hilton Tokyo Bay hotel, and then have a nice tour and lunch at the Ikspiari. Went back to the hotel at the afternoon for check-in and had some rest. Team registration and dinner on the evening. Went to the Ambassador Hotel for IBM's Techtrek program, which mainly shows IBM's vision about new technologies which will probably be the future of IT. After that, we took a monorail train to the Disney Sea for an excursion sponsored by IBM. 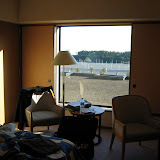 Returned to Hilton Tokyo Bay at night and enjoyed the Cybercafe. The opening ceremony consists of speeches from ACM, IBM, and UPE representatives, plus some entertainment. Two practice sessions came after that, separated by a lunch break. We then participated in several short sessions on interesting Japanese cultures (I took Aikido, Zen Meditation, Anime, and Calligraphy). The world final consists of problems A through J, we solved A,B, and G only. Quite disappointed because we actually can do better. Warsaw university (Poland) won the first place, and we end up in the 44th place. Nice dinner and entertainment after the awards ceremony. Moved to the Green Hotel Ochanomizu in Tokyo, took a train to Shinjuku for sightseeing, took another train to Harajuku, visited the Meiji-Jingu shrine, take a walk through Omotesando and then to Shibuya. Took another train back to the hotel for check-in and went out for a dinner. Walked to Akihabara, went to Ueno Park by train. Lucky enough to view the early cherry blossom. Moved to Ginza, visited the Sony Building, and walk to the Tsukiji fish market for a sushi lunch. Took a subway to Asakusa, and shopped for souvenirs. Went back to Akihabara to look for electronics (camera), and have a ramen dinner before going back to the hotel. Took the Airport express train, board the Singapore Airlines flight back to Jakarta via Singapore. End of the journey. Each part of the stories will be posted separately on a chronological basis, although pictures may be placed not in a strict chronological order. Felix Halim has also written his version of the story, you can find it in his website. The pictures are hosted by Google Picasaweb. You can also take a look of the more complete pictures collection in my Picasaweb gallery.